מאת דני עוזיאל ~ 13 ביולי, 2012. בקטגוריית: English, אנגליה, מדריכים, שווקים. Even though I've visited London many times, somehow I always missed out on visiting its most famous market. It could be that I didn't want to go at all because all the other English markets that I saw didn't impress me that much. Anyway, this time I decided not to give it up. Like the Polish saying goes "I actually enjoyed myself!". 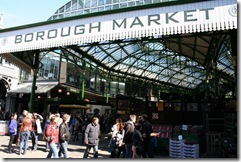 The Borough Market sits on the south side of the Thames River. 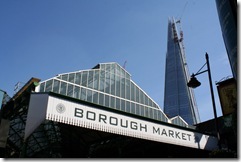 It's very easy to get to the market from anywhere in the city because it's right near the London Bridge train station. The current market is the successor of the one that existed near the London Bridge during the Middle Ages, and that caused heavy traffic jams thoughout the generations. 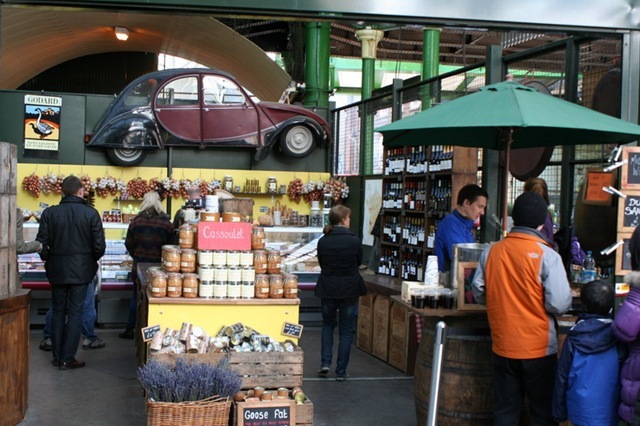 Some of the market's buildings were built around the middle of the 19th century. The market is divided into different sections, but the small allies that surround it are also filled with interesting findings. Please notice the market's opening hours. While some of the stands are open throughout the week, the busiest time is Thursday through Saturday. Saturday is the longest day the market is open. 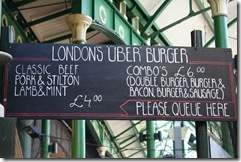 The most important thing to do before you plan to visit the Borough Market is to fast. 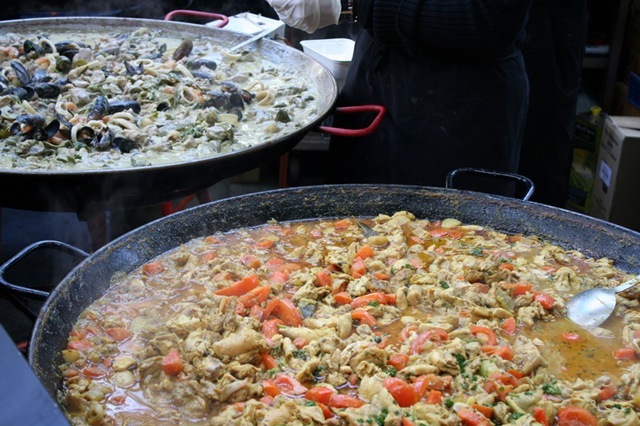 There's an enormous assortment of interesting foods and a large amounts of tastings as well. Truth be told, just thinking of all the tastings, it reminded me of the episode of the Simpsons, when they visit a big supermarket on Sunday to have a festive lunch from all the tastings offered. 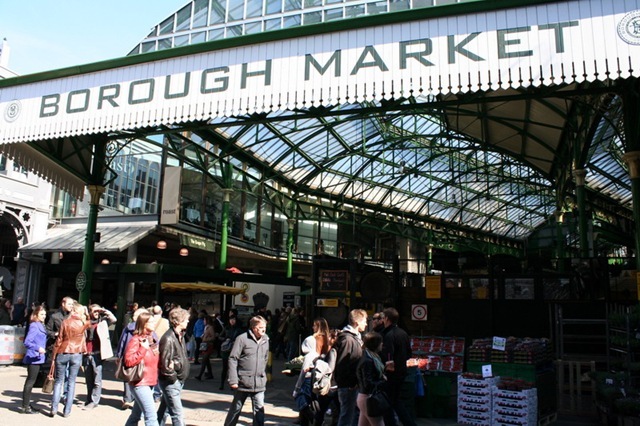 Since I can't make a full list of all that there is to find in the Borough Market, I've decided to list only a small and select list of the stands that I saw, tasted or smelled. The Rabot Estate – a shop that specializes in cocoa products. 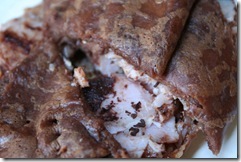 They also sell an enormous selection of chocolate products from South America. 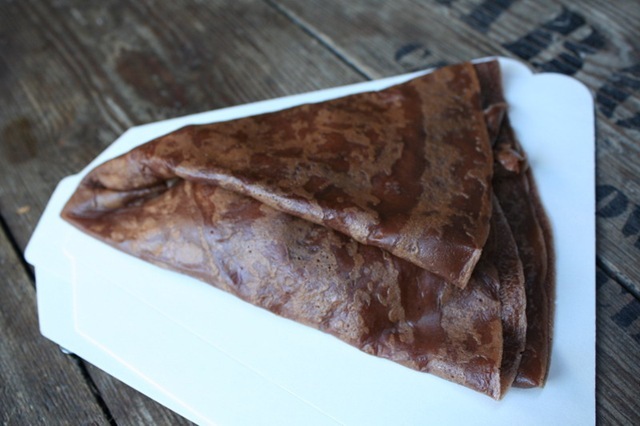 I have to point out that the two bitter chocolates we tasted didn't impress us, but our eyes were suddenly drawn to the cocoa Crepe menu that the shop had. 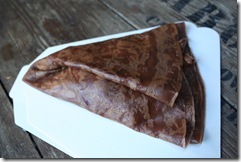 We first thought to order a crepe with goat cheese, but then we saw something more interesting – a cocoa crepe with ham (from Sillfield Farm, more later), matured cheddar, and bitter chocolate crumbs. I know the ingredients sound like they came from a last century cookbook, but it turns out that the combination of tastes was pure genius. 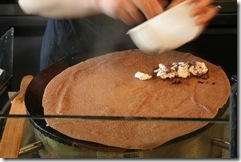 It's a shame the crepe was finished so quickly. Sillfield Farm – this was the first place my hand reached for my wallet in order to buy something. 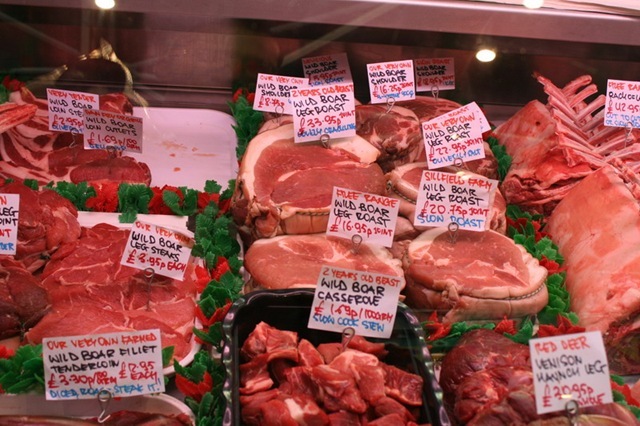 The farm is located in the Lake District, where they grow and tend different farm animals as well as wild boar. 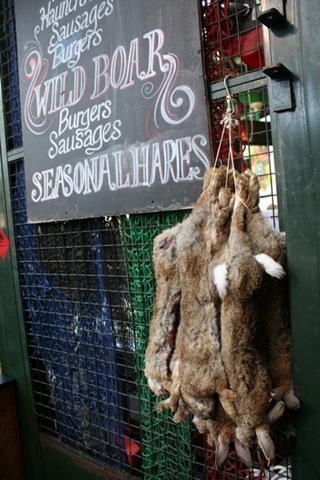 Generally, I don't remember encountering so many wild boar and game products in England before. The market was full of them and I also noticed them at butcher shops and supermarkets elsewhere. 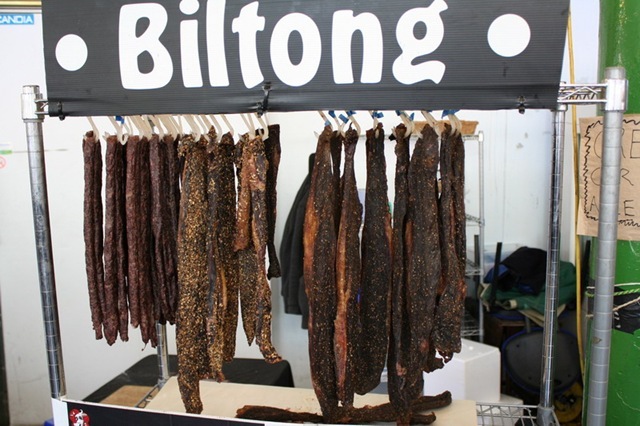 This fact shows a broader distribution of game products that were hunted in the past and are now grown in farms. 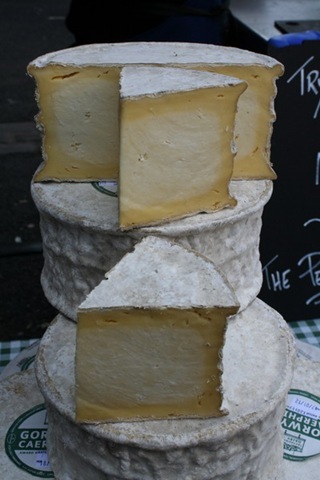 Anyway, the shop in the market mainly sells fresh meat and other meat products, but I also found a number of rare local cheeses. 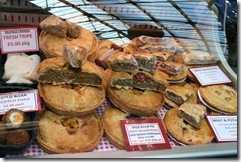 They also sell a few interesting mini pies, for example wild boar with apricots pie and also with wild berries. The expiration date on most products was very close so I didn't buy everything that I wanted. 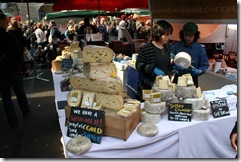 I did buy a couple of blood sausages (better known in England as Blood Pudding) and a few interesting cheeses. Godard – a crazy French shop with goose and duck products. 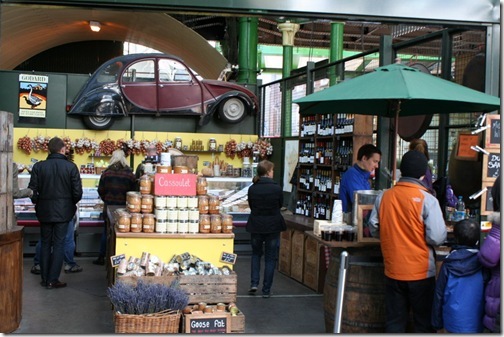 The shop is very easy to recognize because it has a profile of a Citroën 2CV hanged above it. 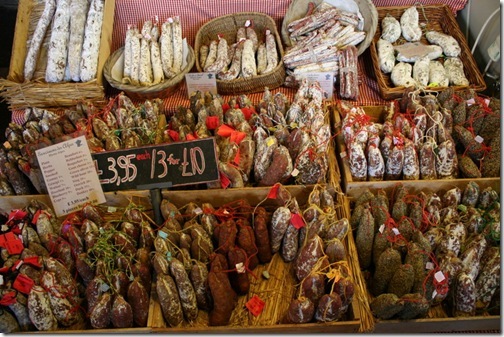 If you're interested in making a Cassoulet dish, you'll find all the ingredients in this shop; and if you consider yourself lazy, you can also buy a Cassoulet dish as a canned good. I didn't buy anything and now I regret it. 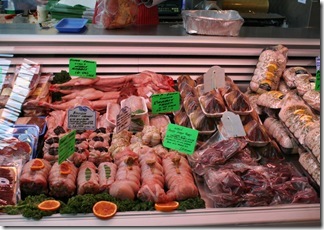 Furnass Fish & Game – pure heaven for people who love fresh game. On display were countless amounts of game, mainly deer and wild hare (which taste completely different from the domesticated rabbit). 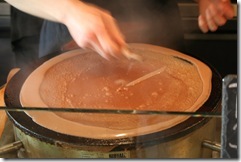 Most of the products come from the Cambria district in the northwest of England. 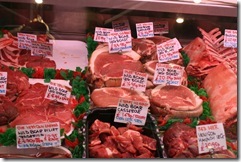 I was so excited by the meat display that I forgot to check out the fish display. 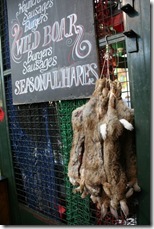 You can't miss the shop because there are a bunch of wild hares hanging to dry outside the shop's sign. 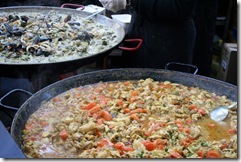 Vegetarians – BEWARE!! Turnips – I feel a bit uneasy writing about a fruit and vegetable stand, but I guess there's no choice. 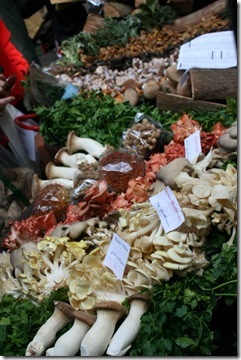 The vegetarians among us would have a great time in the shop. 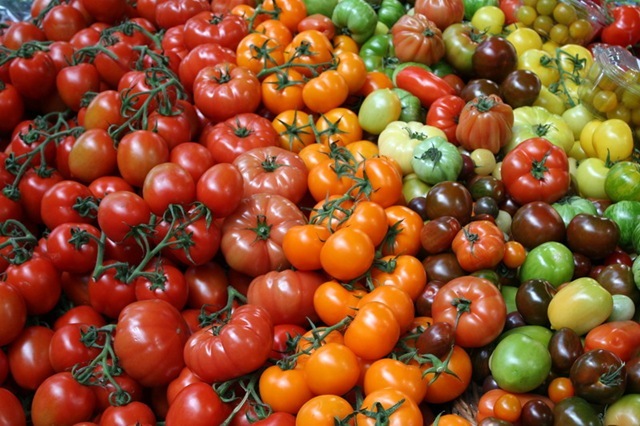 The main attraction is the colorful tomato table, whose picture is seen at the head of this post. 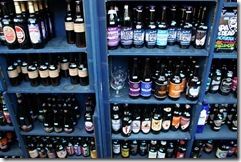 All the products are grade A and there is a tremendous selection to choose from. 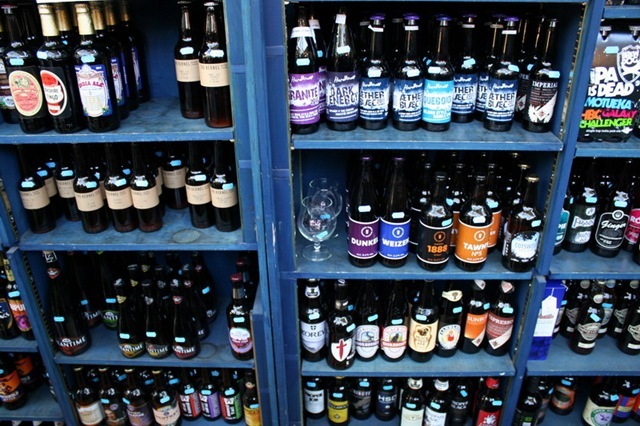 Most products are from small and local farms around England, and the rest is imported. 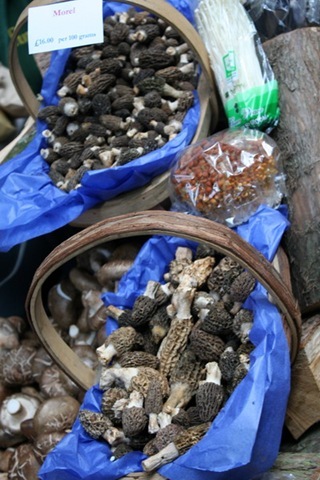 I was mostly interested in the mushrooms, where there are fresh morels to be found, as well and truffles and truffle products. 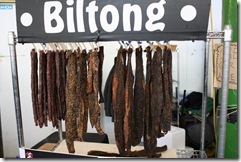 Gamston Wood Farm – a farm from the Nottinghamshire districts that specializes in exotic meat. 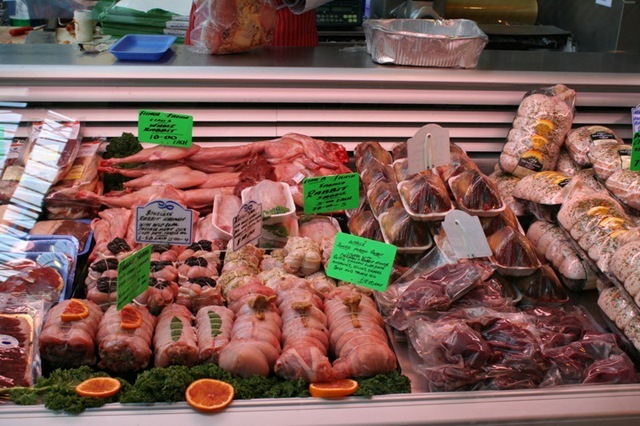 Meats found in the shop include buffalo, ostrich, moose and zebra. There's also a corner in the shop where you can buy special burgers (as opposed to just "ham" burgers). I couldn't help myself and ordered a kangaroo burger with mayonnaise and wild berries. The burger was amazing, thanks for asking. 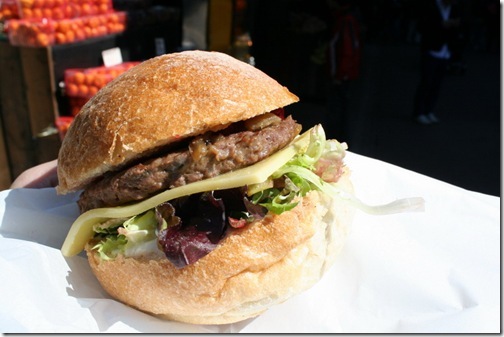 The 'roo burger reminded me a little of game meat and went well with the wild berries. I regretted not buying some ground zebra meat for later use. Shellseekers Fish & Game – just like I missed the fish display at the Furnass stand, here I missed the display of game. It's not surprising that I did considering there was a medium sized shark on display. I think it was a Blue Shark. They even strategically placed a halibut in its jaws in order for the scene to look like it came out of a National Geographic magazine. As in the other fish shops, we were very impressed by the huge selection and freshness of all the products. An unidentified fish shop – at the eastern side of the market we bumped into a huge fish stand with a very big selection of flat fish. 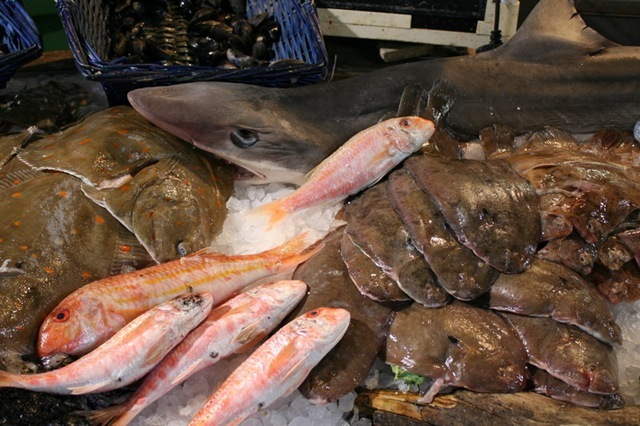 Forget about the anonymous flat fish that you'd find in the Israeli supermarkets. 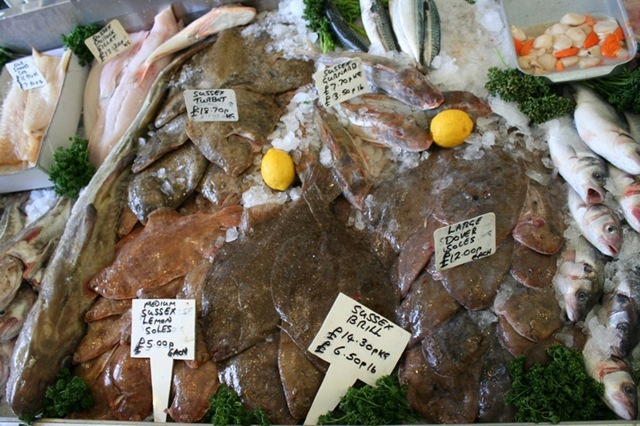 Here there was a huge selection of halibut, turbot and Dover sole. A real eye opener. 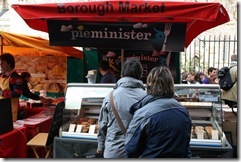 Pieminister – after laughing about this producer's funny name, we started inspecting the shop's products. 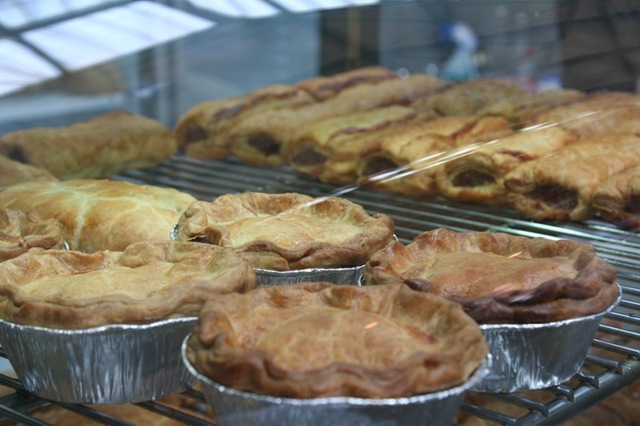 There was a big pie selection including veal with different beers, pork with different spices, and also a fish pie with the funny name Pietanic. 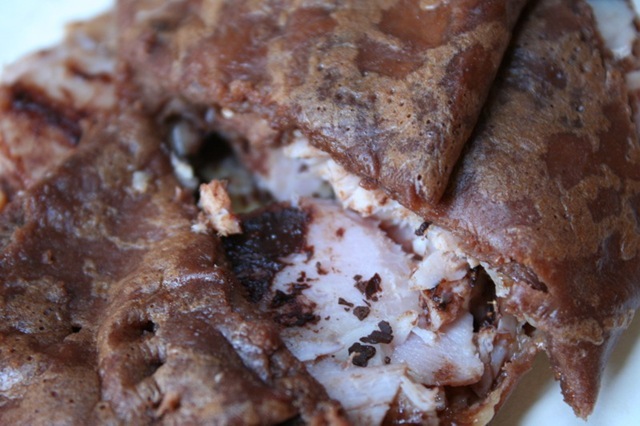 I decided to try the Pietanic, which included 3 salt water fish meat and a creamy gravy. We decided to sit by the Thames River while we ate. We enjoyed the view of the heavy cruise HMS "Belfast" (which these days is used as a floating museum), and of the London Bridge. 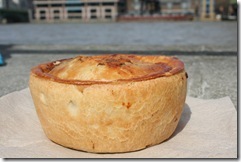 The pie was delicious. 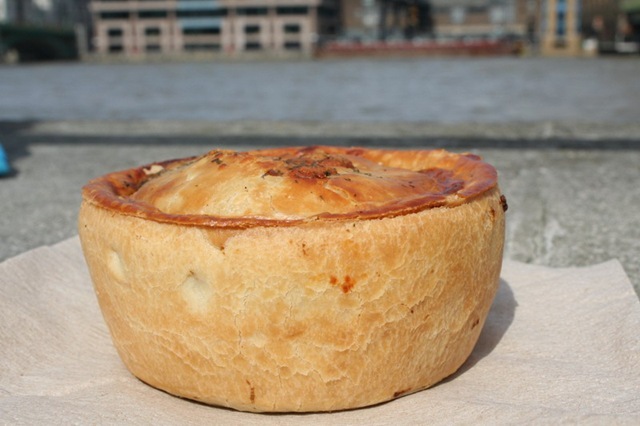 A few days later, while sitting in a pub with some friends, they told me that I could buy Pieminister pies in the British quality supermarket chain Waitrose. 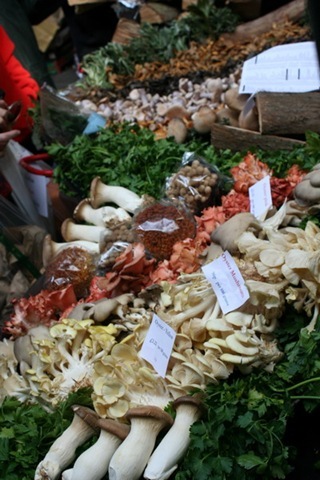 While walking around Borough Market we saw a lot more interesting things. We encountered an American lady who gave us a tasting of her brownies with walnuts, which were amazing. 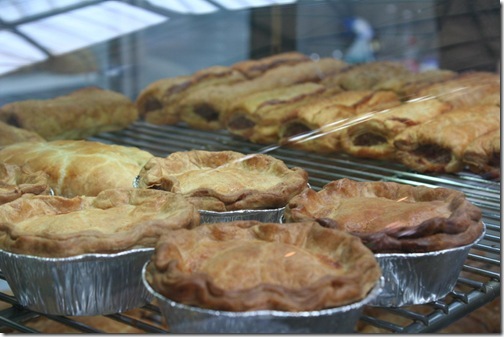 Generally, there are plenty of pastry and cake stands and shops. Most cream cakes look "tired" because they aren't put in a refrigerated display. It also looks like the muffins are as popular in England as they are in the USA, maybe even more. The breads mostly looked amazing, even though there's a tendency for French and Italian style bread – which is great by me. 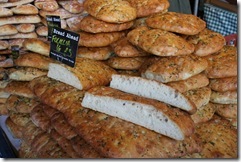 There still appeared a large number of dull English breads and even duller English rolls. 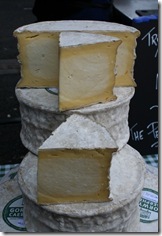 Cheeses are also an abundant product in the market, including some very interesting English ones. As in Israel, the impression is that small and local dairy products are much more expensive than imported cheeses, which also display a huge selection. 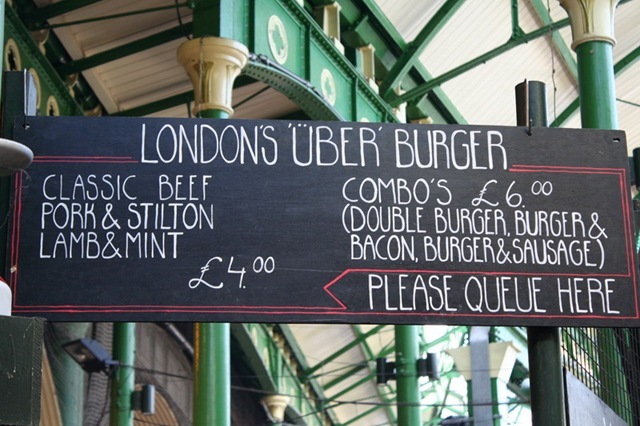 As said before, the market isn't far from the Thames River and if the weather is good enough, you can walk off what you've eaten. Unfortunately, we couldn't spend too much time in the market because we had to get ready for our reservation at Gordon Ramsey's Maze restaurant. 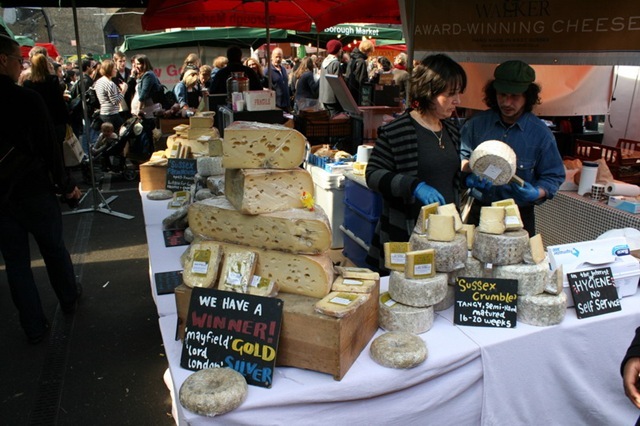 Anyway, with or without Ramsey, a visit to London without visiting the Borough Market is like a sunny side up egg without bacon. And to that the English say – 'nough said.